Reporting from the Election Protection Coalition’s phone center Tuesday, there were many sobering tales of long lines at polls, malfunctioning machines, and eligible voters being disenfranchised. Our own voter suppression map documented more than 50 trouble spots around the country. 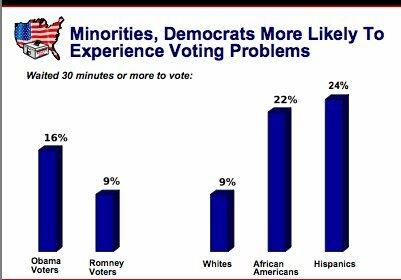 Those problems, magnified by Republican-led laws mandating government issued-photo ID, restricting voter registration and curtailing early voting, didn’t swing the election to Mitt Romney as his Republican colleagues hoped. This isn’t just a problem of logistics: It’s a moral issue. When someone has to step out of a voting line because they can’t afford to take three or four hourse off of work just to go vote, they are being disenfranchised. The election may be over, but this is a problem that still needs to be solved.